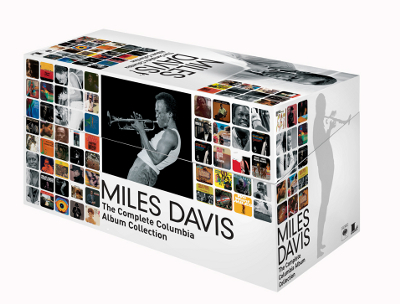 Columbia/Legacy presents Miles Davis – The Complete Columbia Album Collection, a deluxe, limited edition retrospective of the iconic music Miles Davis created during his 30 years with Columbia Records. This exquisite package, comprised of 70 CDs and 1 DVD, contains all 52 of Miles’ Columbia recordings in Japanese-styled mini LP jackets and includes a 250-page book with a biography, a fully annotated discography, a complete song index and rare photos. Appearing on DVD for the first time in this box is Live In Europe ’67, shot in Stockholm and Karlsruhe during the Miles Davis Quintet’s European tour of 1967. Completely remastered from the original broadcast tapes, these performances feature Miles with Wayne Shorter, Herbie Hancock, Ron Carter and Tony Williams. In addition to the DVD there will be a first-time audio release of the full performance from the 1970 Isle Of Wight festival. Bonus tracks and other rarities that have been added to the CD reissues of individual albums in past years are also included. • Limited Edition – Only Manufactured Once!